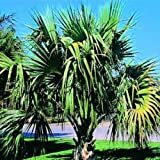 Leaves color green leaves in frond shape when the start to grow it’s like sword when it’s open rounded shape in shredded like fork or spoon narrow tines in the size 1-2 m.
Flower color yellow to white, flowers grow on clump its branch on every branch can be hundreds, bloom clumps very showy. Fruit edible, color of the fruit purple-black, the fruit round dry and sweet. 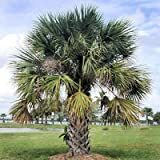 What can be done with big quantities of Sabal palmetto fruit?